It's the first round of the 2018/19 DFB-Pokal this weekend. All the big guns are in the competition from this stage so there's plenty to look at and consider for betting. Let us know your tips for this upcoming weekend of cup action! 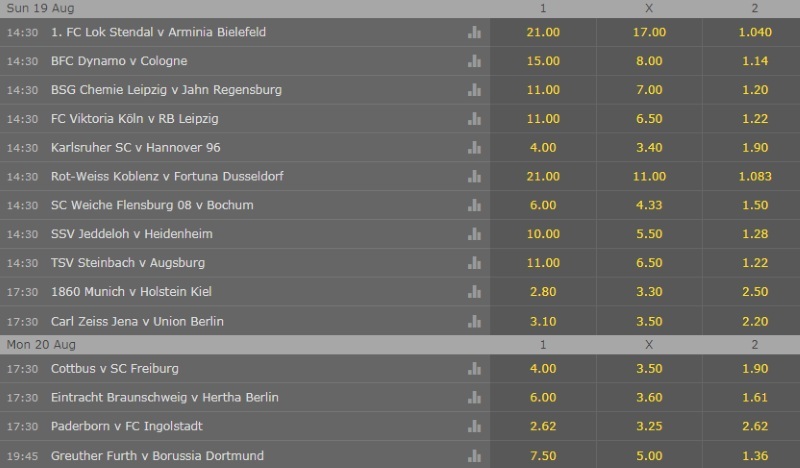 The 1st Round of the DFB-Pokal is always a tough one to predict with so many odds skewered due to the clash of abilities between sides. I was tempted to back a tiny minnow against one of the big boys with a massive handicap but eventually I settled on Dynamo Dresden simply getting the win away to SV Rodinghausen in a 2:30pm kick-off this Saturday afternoon at the Hacker-Wiehenstadion. Undoubtedly, some of you will need an education, just like I did, on the home team here. SV Rodinghausen currently play in the Regionalliga West IV in German football. Managed by Mario Ermisch, they are a club that were in a league with a number of reserve sides belonging to Bundesliga clubs including Borussia Dortmund II, Borussia Monchengladbach II, and FC Koln II. Dynamo Dresden are currently competing a bit further up in Bundesliga II. Uwe Neuheus saw his team finish in 14th place last season and narrowly avoid the threat of relegation by just a single point. The club has started this campaign with one win and one loss so there's the potential to build morale here. The factor that drew me to this game was the odds on a Dynamo Dresden win. Without the handicap it's a conservative but tempting 1.54. Throw in a -1 handicap and those odds move up to 2.35. I'm probably going to be a bit of a bottle job here and tip the one goal win. My knowledge of the home side this season isn't strong enough to condemn them to a beating. I do think Dynamo would be shocked to fail to win this though and it seems an easy pick up at that price. @Magic0024, @malabgd, @sajtion, @betcatalog, @DrO, @Neubs, @Xcout, @Banter1, @Bayern, and @JKos, interested to hear if any of you guys are thinking of a bet here? What is your preferred approach for one-sided cup games like this where the odds are so biased? I wouldn't recommend an odd at about @1.5 for an away win in DFB-Cup when a team from 2. Bundesliga plays against a fourth tier team. As a Dynamo Supporter myself I see an possible upset spot for Dynamo in this game. Of course, there is a clear gap in quality between the clubs, but Dynamo had a difficult last season and I don't have the feeling this season will be different. We had discussions about the system, coach Neuhaus has lost authority because of strange decisions even though he hasn't been fired yet. It's all in all a shaky situation and we had problems against a fourth tier league club ( Koblenz and they got relegated at the end of the season ) in the first round of DFB-Cup last year, winning 3-2 even it wasn't a real away match ( neutral ground near Dresden ). I have not much to say about Rödinghausen beside the statistics everyone can look up themselves. Match is played on neutral ground near Rödinghausen. 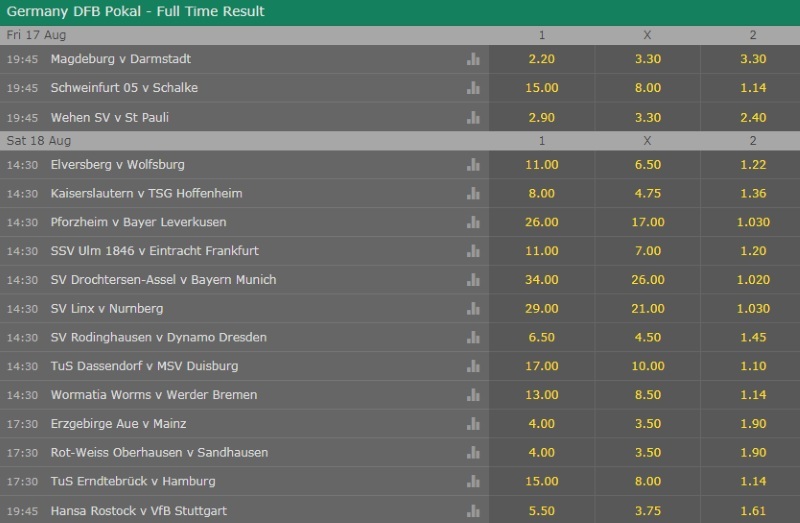 Even though Dynamo should win in regular time, it's not a good decision to take them at these odds in my opinion. Asian Handicap +1.5 was good under the week. Now it's +1.25 and I'm not sure about that. But I just wanted to add my opinion, so everyone can learn about leagues one is not 100% familiar with. Unfortunately, this is what I ment. Dynamo loses 2-3 in the final seconds of extra-time. Not a good game by Dresden, in particular in the second half. Referee had some slightly strange decisions in favor of Rödinghausen but ok, it was simply not enough and if you take the whole game into account, Dresden played like the past twelve months and that was the reason I was so suspicious about them. Normally with so many one-sided cup games, I would only made a combination with a low stake in order to have something to look up the results afterwards. But with such small odds, an upset might happen, and this weekend there were several, talking about europe football in general.